On the horizon, from the trig. 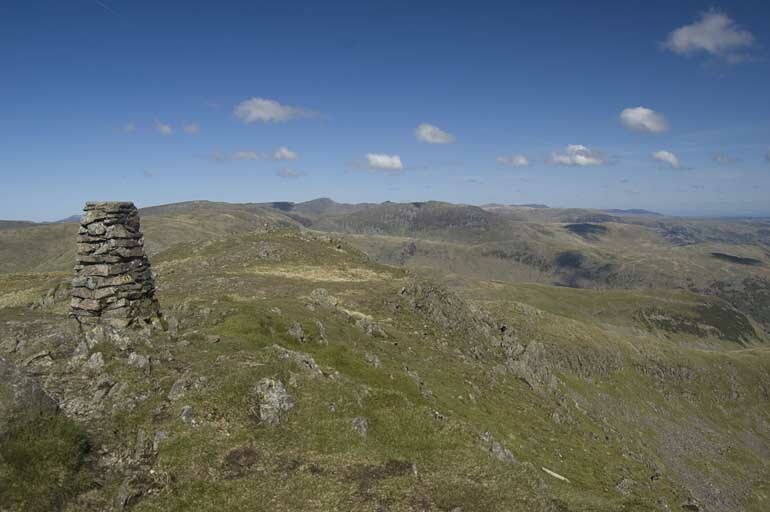 column, lie Fairfield, Hart Crag, the sharp peak (a blip) of High Crag, Nethermost Pike, Helvellyn, the sharp, prominent peak of Catstye Cam, St. Sunday Crag, Great Dodd, Blencathra, Hart Side (with Sheffield Pike in front, and the shadow of a cloud on Birks in front of that), Bowscale Fell and Souther Fell. Smaller version of this picture.